After months of planning, procrastination, worrying, and anticipation, the day that actual work on the boat barn would begin approached. I had received word from my excavator that he'd be able to begin the site work probably during the week of July 28, so I began to make my own preparations for the subcontracted site work. 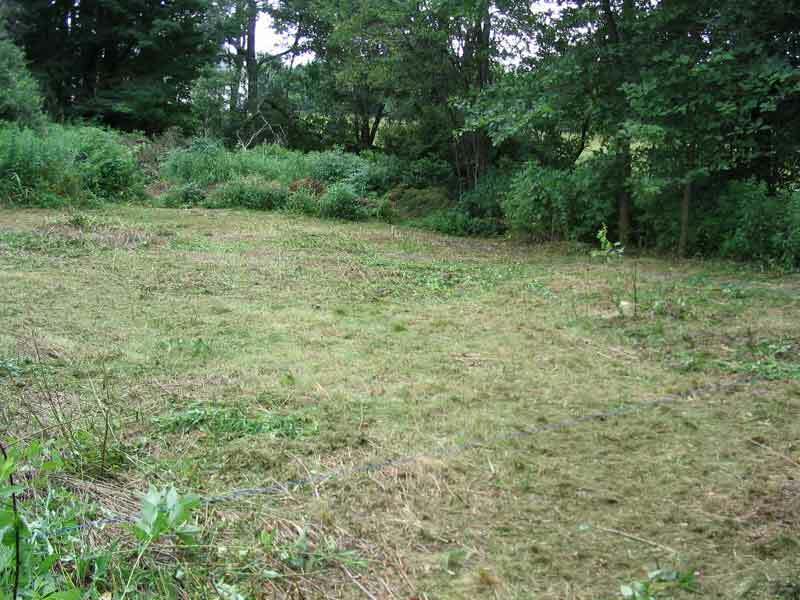 The barn location at the back of my property was covered with thick underbrush and thigh-high grasses and weeds. In addition, there were several small birch trees, as well as a few larger birches. All of this needed to be cleared out of the way before the true earth work could begin. Fortunately, the site was not heavily wooded--it was already a natural clearing, with fewer trees than the rest of the back area of the property. Over a period of two days, I cleared most of the site. In one day, I chainsawed three sapling trees (easy) and 3 or 4 larger trees, cutting off the branches and chopping the trunks into manageable lengths that I threw back into the woods behind the site. As tends to be the case, the trees all seemed much larger once they hit the ground than they did when standing, and cutting them up for removal was a big job. Finally, though, a roughly rectangular area was free from trees and branches. I left any remaining work for another day. 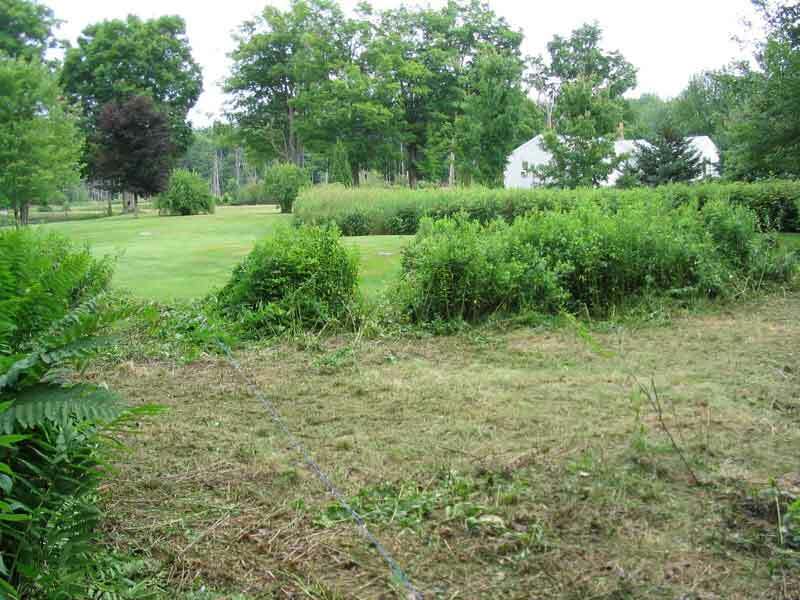 About a week later, I attached a solid cutting blade to my monster weedwacker and set to work chopping through the 4' tall goldenrod and other underbrush in an attempt to clear the bulk of the site. The weedwacker made short work of the brush and growth; I left a slight ring of brush around the lawn edge of the new clearing for the moment, to sort of hide the work in progress until the last minute before the excavator arrived. 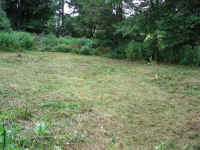 Once I had most of the stuff cut down, I used my tractor and mower deck to further clear the area. With the bulk of the area cleared, I set up a series of corner stakes and a string line (which I had set up earlier in the spring) to depict the general location of the barn. With the goal of leaving enough room on the southwest side of the structure for one or more boats, as well as attempting to keep the barn as far back in the woods as possible given the size and shape of the cleared area, I test-fit the stakes and made some adjustments until they marked out a location that I thought seemed pretty good. I left the string and stakes in place for several days to mull the decision and make minor adjustments as needed. As of last Friday, all I knew was that sometime this week, the site work would begin. However, knowing the contractor the way I do, I was prepared that it might begin Monday, even though I had no confirmation. Sure enough, at 0645 Monday, the phone rang, and Scott Dugas told me that they were planning to start this very morning. At about 0700, the first man arrived, Tom, to scout out the driveway location with me and get prepared for the job. 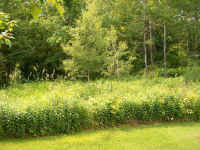 We discussed the location (the day before, I had mowed the lawn and had left the general driveway area unmowed as a sort of indicator of the new driveway) and then he set to work laying out the borders with a measuring stick and traffic paint. 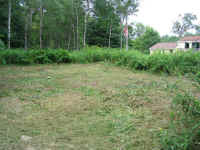 Meanwhile, I fired up my weedwacker and completed cutting down the brush in the barn area; I had been intending to do it today anyway. The heavy machinery arrived by about 0745, the two large flatbed trailers tying up the morning traffic. I always wanted to drive construction equipment when I was a kid, so of course it's always cool to have bulldozers and excavators (what we used to call steam shovels) around. After a week of lousy, humid, cloudy and rainy weather, Monday had dawned cool and crisp, with dark blue, cloudless skies. A great sailing day, but alas...I'd need to stick around the house to deal with any unforeseen issues with the digging, should the arrive. 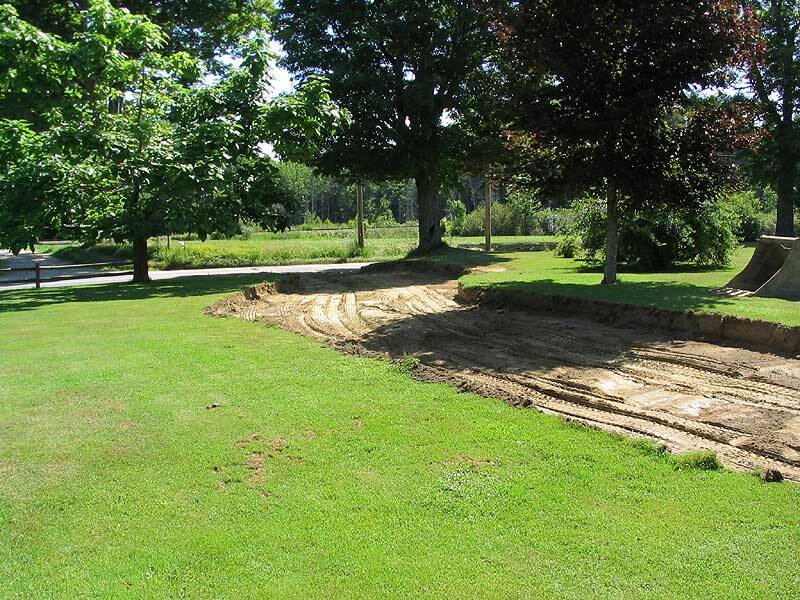 With the excavator, Tom scraped off about 12" of the loam and sod to make way for the driveway base material, beginning at the road and working inwards towards the barn site at the back of the property. Watching one of these machines in the hands of a pro is like watching ballet; the hydraulic arm and bucket moved with symphonic elegance. Throughout the day, work on the driveway progressed. 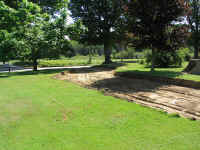 The loam was carefully scraped off; some was placed along the driveway and barn area to fringe the compacted fill that would be placed there, but the rest (80-100 yards) was piled up to be trucked away for credit against my total bill. The rear portion of the driveway and especially the barn site back in the brush was full of good loam. Several times throughout the day, I had to make some decisions that changed the job a bit and, of course, that will probably add to the cost. Sigh. But there's only one chance to do the job right, and so it goes. 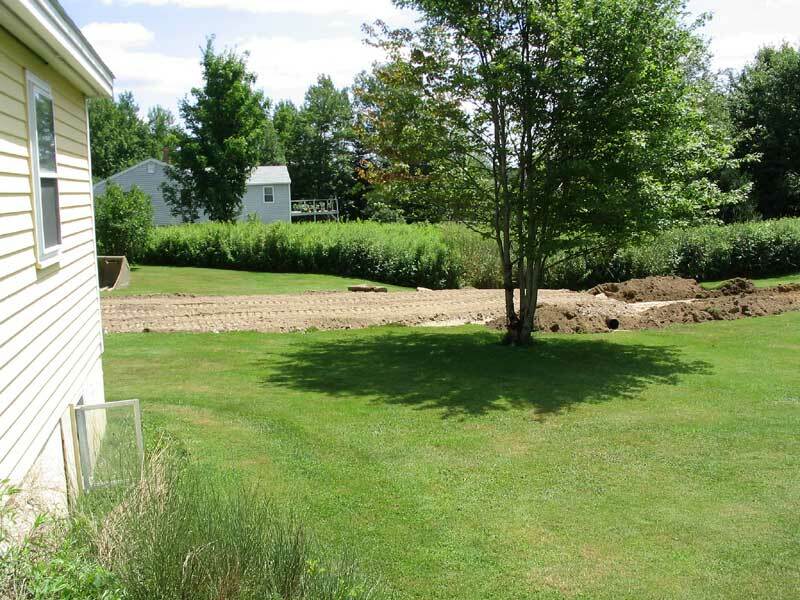 Among the minor changes to the original job quote: we decided to add a culvert at a natural low point in the terrain, and to bring the driveway up over it. 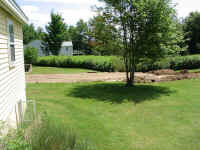 It was obvious, as Tom and I looked things over early in the day, that, even though I don't get much for pooling water or severely mushy ground at any time, having the driveway go through the area would create a dam that might exacerbate any issues. So in went an 8" culvert. 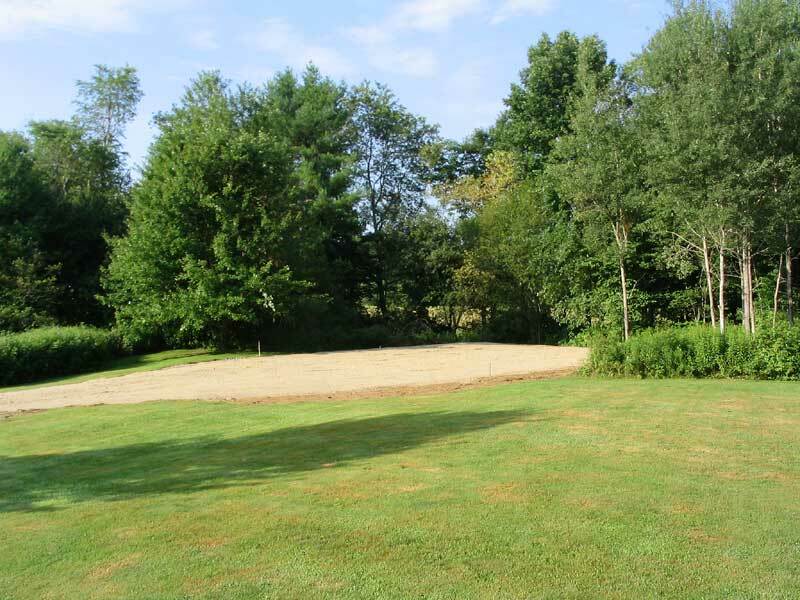 I also decided that a compacted fill pad was needed next to the barn, for extra boat placement, etc., so that area had to be dug out as well, plus extending the width of the driveway near the barn to accommodate. Click here to see more photos of the day's site work. A Train of Trucks: This morning brought an impressive array of 10 and 12-yard dump trucks, all lined up along the street. The activity in the backyard was reminiscent of a strip mine, with a steady stream of trucks beep-beeping their way in and the excavator busily loading them with my large pile of topsoil. 1, 2, 3, 4, 5 trucks full. One starts to understand the high cost of site work and excavation when you see a showing like this--and this is a small job. But four or five large dump trucks, each with a driver, plus the man operating the excavator, and the associated costs involved with the purchase, insurance, and operation of all these vehicles...yeah, it adds up. The owner of this particular business used to own a 31' lobster yacht named Sand Dollars, which I always thought was pretty clever. Throughout the day, work continued. Trucks dumped sand and gravel for the base, and Tom spread it as necessary, jockeying between three different machines. Right around lunchtime, I found someone at the door: one of the Maine Department of Transportation (MDOT) reps who drive around aimlessly in pickups. "Hi, do you have a permit", he asked? "Sure I do," said I. I did--a town building permit. I knew instantly that wasn't what he meant. "A driveway entrance permit," he asked? A what? "Since this is a state road," he went on, "you need to file for a permit with MDOT." Fortunately, he was very nice, and gave me the proper application to send in. He said it didn't appear to be a problem where the driveway was, but that the application needed to be on file, his boss would have to probably come check it out, blah blah blah. I thanked him for being understanding and allowing my ignorance, and promised I'd send the application right in--which I did, later the same day. Amazingly, there was no application fee or other charge, the normal scourge of bureaucracy. The rest of the project proceeded without a hitch, at least as far as I could tell. By 1600, the work was done. I had a not-particularly attractive, but functional and solid, driveway and slab base , all with minor disruption to the yard. 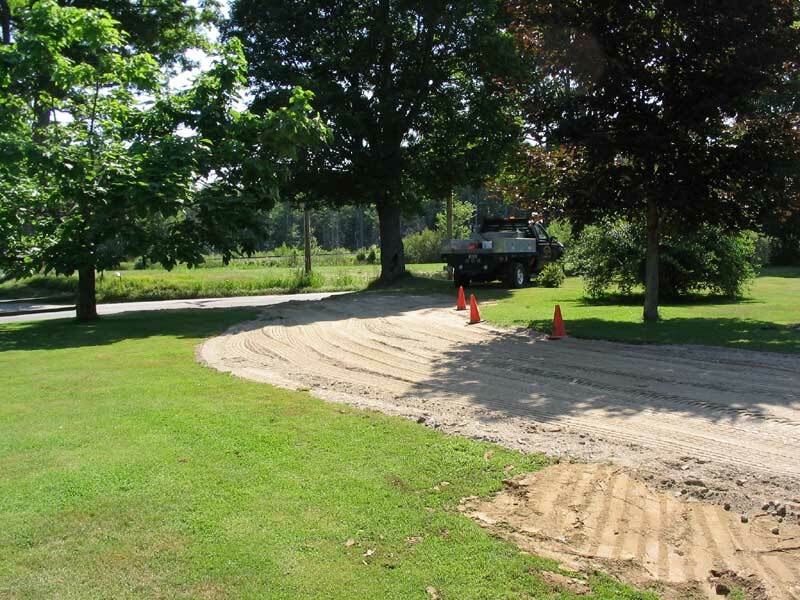 Some minor raking, seeding, and general cleanup will take care of making this new road fit into the landscape better. All in due time. Click here to see more photos of the completed driveway and pad.